Home / Barbados Postal Orders / When was the last time you saw a Barbados Postal Order? 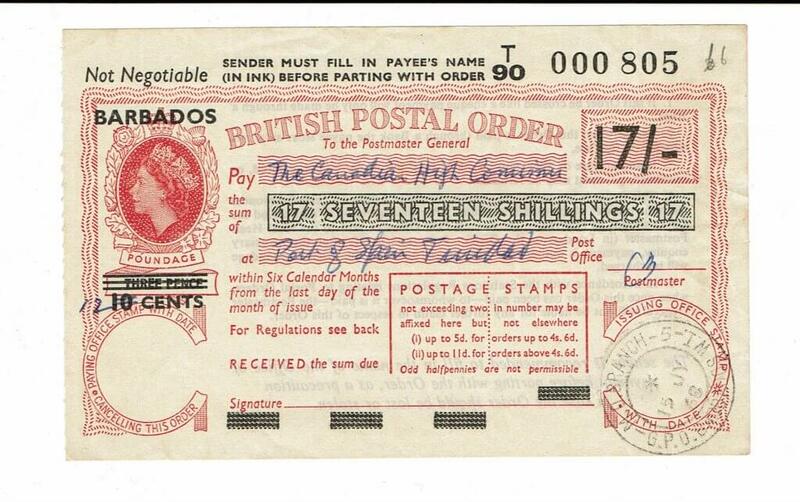 When was the last time you saw a Barbados Postal Order? OK, so it’s not stamps, but there are other items which were available at the Post Office that make a fascinating study and Postal Orders are one of these. Postal Orders, typically, would be destroyed after being cashed so it’s quite difficult to get a good collection of them however mint ones do come up for sale on a fairly regular basis. Some, like this one, tell a story of a world in change. The image was supplied by a very kind reader of this blog who also offered these thoughts on the PO and the fact that the printed “THREE PENCE” becomes “10 CENTS” which then became “12 CENTS”! “The British Post Office implemented a poundage increase from 3d to 4d around that time and of course it applied to all postal orders no matter where sold. As you guessed, rather than withdraw all the old stock and resupply new stock they just told Post Offices to charge more and report it in their accounting. This worked out fine in UK Post Offices as they sold vast quantities of postal orders every week so the old supply was used up quickly. In the Colonial countries though there was not such a high demand so stock could sit around literally for up to a year or more for some of the odder, less popular, denominations such as this 17/- one. So as not to make a mistake and charge the lower poundage rate printed on the postal order many of these were uprated locally by rubber stamp, or manuscript, to show the new rate. I have some postal orders that have been uprated twice or even three times in such a manner. In fact I just took another look at the scan I sent you and, judging by the serial number of that postal order (T/90 000 805) and comparing it to a 17/- one I have in my collection which was issued in UK (serial no. T/97 877 789 with an issue postmark of 04 NOV 1961 on it) it looks to me like this Barbados overprint one could have been printed and delivered from as far back as 1960 or 1961 if it had been issued in UK which is a staggering amount of time to be sitting around waiting to be sold. It most definitely is interesting and a huge thank you to Tim who took the time to send me this detail. We love all things Barbados on this website and anything to do with the Post Office is always very welcome. If you have a story you think would make good reading, why not let me know? Details are on the Contact us page.